Thermotolerant inulin-utilizing yeast strains are desirable for ethanol production from Jerusalem artichoke tubers by consolidated bioprocessing (CBP). 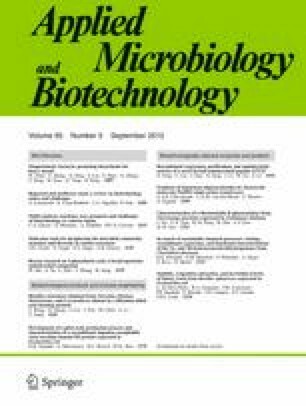 To obtain such strains, 21 naturally occurring yeast strains isolated by using an enrichment method and 65 previously isolated Saccharomyces cerevisiae strains were investigated in inulin utilization, extracellular inulinase activity, and ethanol fermentation from inulin and Jerusalem artichoke tuber flour at 40 °C. The strains Kluyveromyces marxianus PT-1 (CGMCC AS2.4515) and S. cerevisiae JZ1C (CGMCC AS2.3878) presented the highest extracellular inulinase activity and ethanol yield in this study. The highest ethanol concentration in Jerusalem artichoke tuber flour fermentation (200 g L−1) at 40 °C achieved by K. marxianus PT-1 and S. cerevisiae JZ1C was 73.6 and 65.2 g L−1, which corresponded to the theoretical ethanol yield of 90.0 and 79.7 %, respectively. In the range of 30 to 40 °C, temperature did not have a significant effect on ethanol production for both strains. This study displayed the distinctive superiority of K. marxianus PT-1 and S. cerevisiae JZ1C in the thermotolerance and utilization of inulin-type oligosaccharides reserved in Jerusalem artichoke tubers. It is proposed that both K. marxianus and S. cerevisiae have considerable potential in ethanol production from Jerusalem artichoke tubers by a high temperature CBP. This study was supported by China Agriculture Research System (No. CARS-35), the National Natural Science Foundation of China (NSFC, No. 30900007), and Chinese Academy of Sciences (KSCX2-EW-J-10).